G: Exedra or dining room? I: Room with glass discs depicting cupids, Cubiculum? Y: Room on the north side of corridor U, Cubiculum? The room numbers are those referred to on the pompeiiinpictures pages for VI.16.7. 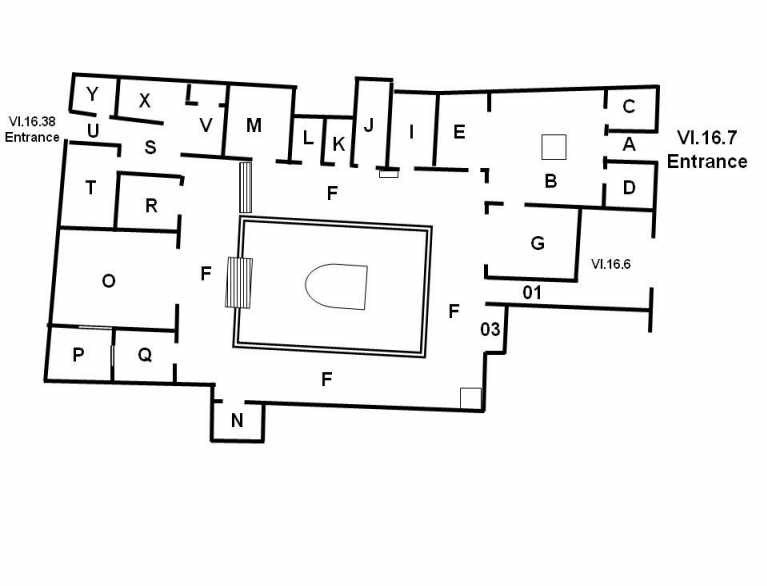 In order to allow cross referencing in your research we have used the same room numbering as that used by Dr P M Allison in her book Pompeian Households: An Analysis of the Material Culture (Cotsen Institute of Archaeology, Monograph 42) and on the accompanying web site http://www.stoa.org/projects/ph/house?id=21 where detailed descriptions of the rooms and a database of finds can be found. The plan shows the entrance at VI.16.38 and the location of VI.16.6. According to Penelope Allison the area 01 on the plan "was taken up with a wooden stairway leading from the garden to rooms above shop VI.16.6". Today it has the appearance of a long, high and narrow corridor. Please be aware that the room numbers shown will differ from any further plans or records both published and unpublished.